Durham County Council wished to install 54 large scale grid connected solar photovoltaic (PV) systems on a selection of their public buildings, all of which were within the County Durham area. This was an ambitious project with a challenging timescale. The client engaged Narec Distributed Energy to provide expert renewable energy technical assistance in the scope-out, feasibility and capacity estimation for photovoltaic arrays upon the roofs of the council buildings. 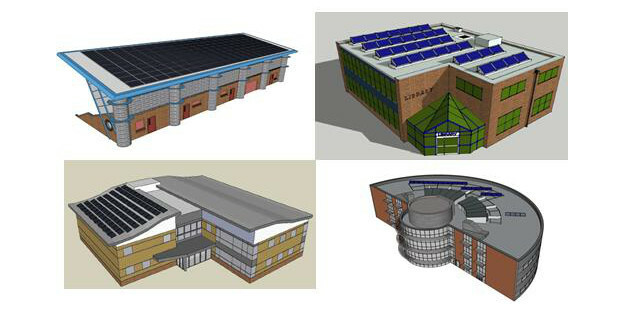 In addition, Narec Distributed Energy was commissioned to provide detailed scaled 3D CAD drawings to assist in the visualisation aspect of the planning consent and to ensure the PV arrays were unshaded from the effects of neighbouring buildings or trees. Utilising specialised survey equipment, Narec Distributed Energy‘s Technology Specialists carried out detailed site surveys ascertaining opportunities and constraints for deployment of PV on each building. Utilising a combination of sophisticated 3D CAD, graphical image manipulation and photovoltaic system design software, a site by site portfolio of arrays were designed between 10kWp and 50kWp in capacity. Scaled diagrams of each building and its proposed array in–situ were produced in conjunction with shading analysis studies to quantify the effects of any nearby buildings, trees or other features. PV energy generation yield calculations were carried out based on the site location, array orientation and tilt and estimations made of the revenue from financial incentives. Narec Distributed Energy successfully carried out the feasibility studies for over 1.8MWp of solar photovoltaics capacity for the Council within the specified time. The council utilised the reports from Narec Distributed Energy in its request for planning consideration and its roll out of the technology on its building stock.